Amazon has slashed 50% off its Echo Dot smart speaker for Black Friday. The £25 discount is easily one of the most generous price cuts we've ever seen on the third-generation Alexa-powered speaker, which launched in the UK last month. For those who don't know, the Echo Dot is the smallest speaker in Amazon's ever-growing arsenal of AI-powered devices. Although it does include a built-in speaker that's plenty loud enough to hear the answers to any questions you've asked Alexa, the Echo Dot works best when paired with a more powerful sound system. This can be done with a 3.5mm aux cable, or via Bluetooth. Music is handled by Amazon Music, Spotify, Audible, Deezer or TuneIn. Needless to say, Apple Music subscribers need not apply. The third-generation Echo Dot boasts an all-new fabric design and improved call quality compared to previous models. The Echo Dot has all the same smarts of its larger siblings, Echo and Echo Plus, meaning it can do everything from playing your music, updating you on the latest weather and headlines, ordering take-away, and controlling your smart devices. 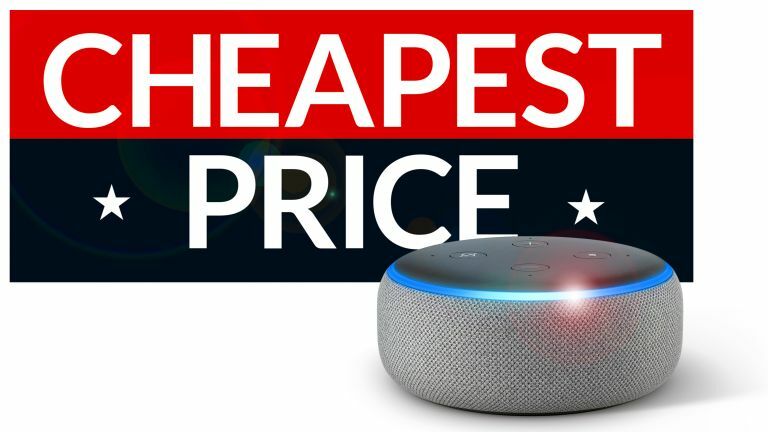 Just about 50% off this powerful little smart speaker makes for a pretty good deal in our books – this lightweight speaker packs all the intelligence of Amazon Alexa, far field voice recognition, and the ability to control your smart home, and order an Uber. If you haven't yet dipped your toe into the world of smart appliances, this is a superb starting point.